The Hunger Games: Mockingjay Part 2 has had no trouble taking down its competitors during its first two weekends at the box office. The franchise finale opened in the top spot with $101 million, although that tally was the lowest debut of all four movies in the blockbuster franchise, and it took in $51.6 million over the Thanksgiving holiday weekend, beating out Pixar's The Good Dinosaur, Warner Bros.' Creed and 20th Century Fox's Victor Frankenstein. 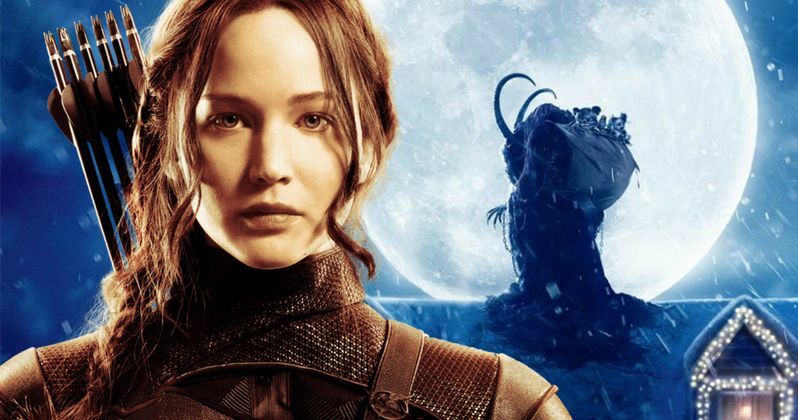 While it is expected to drop significantly again in its third frame in theaters, The Hunger Games: Mockingjay Part 2 will end up on top once again, overtaking this weekend's only new release, the holiday horror-thriller Krampus, according to the projections at Pro.BoxOffice.com. The Hunger Games: Mockingjay Part 2 is expected to take in an estimated $24.7 million over the weekend of December 4, with Pixar's The Good Dinosaur ($20.3 million) and Creed ($17.5 million) expected to remain in second and third places respectively. Krampus is projected to open in fourth place, with an estimated $14.5 million. There aren't any reviews posted for Krampus on Rotten Tomatoes quite yet, so we'll have to wait and see how the nation's critics receive this thriller, which opens in approximately 2,800 theaters nationwide this weekend. While the holiday season represents the most magical time of year, ancient European folklore warns of Krampus, a horned beast who punishes naughty children at Christmastime. When dysfunctional family squabbling causes young Max (Emjay Anthony) to lose his festive spirit, it unleashes the wrath of the fearsome demon. As Krampus lays siege to the Engel home, mom (Toni Collette), pop (Adam Scott), sister (Stefania Owen) and brother must band together to save one another from a monstrous fate. The supporting cast includes Allison Tolman and David Koechner, with Michael Dougherty (Trick 'r Treat) directing. Spectre is expected to round out the top 5 this weekend with $8.4 million. Rounding out the top 10 will be The Peanuts Movie ($5.3 million), The Night Before ($4.8 million), Secret in Their Eyes ($3 million), Spotlight ($2.8 million) and Brooklyn ($2 million). After a stellar opening in limited release, it isn't known if there are plans for expansion for The Weinstein Company's The Danish Girl, another awards season contender starring Eddie Redmayne, Alicia Vikander and Amber Heard. The drama, based on an incredible true story, took in $185,000 from four theaters, for an impressive $46,250 per-screen average. Opening in limited release are Spike Lee's Chi-Raq, Amplify's Christmas Eve, Cohen Media Group's Hitchcock/Truffaut, Sony Pictures Classics' The Lady in the Van, Freestyle Releasing's The Letters, Cinedigm's Life, The Weinstein Company's Macbeth, Saban Films' Mi-5, Atlas Distribution's A Royal Night Out, Drafthouse Films' The World of Kanako and Fox Searchlight's Youth. The Letters will actually open in roughly 1,000 theaters, so it's possible that a strong showing could vault it into the top 10, but we'll have to wait and see. Several of these films, such as Youth, have been getting Oscar buzz lately, so we'll have to wait and see how audiences respond in limited release.